In the first part of this series I discussed the business processes, roles/groups, database and form customisations, and addition data required to enable the purchasing module to really work for my fictitious organisation. In this post I am going to continue the series to cover the business rules and training required to technology enable my business process and minimize the amount of manual intervention. In order to write these business rules we are going to walk through the process described in the earlier post – at this stage I need to express a great deal of thanks to Nashco Solutions who have developed a very cool “Business Rules Print Preview” that gives you a very simple and effective view of your business rules, and who have let me trial this addon free of charge. Using this tool I can provide you (my readers – I am assuming there is more than 1!) with a printable version of each of the business rules involved. The first business rule we need is the one that takes a ticket (incident) and assigns it to the Procurement Team if the Subject ID = “PR”. Not very exciting but it does the job. If you enable the Subject ID to be available from Self-Service then the rule will work automatically from there as well. You might want to add the Purchase Request tab to your Incident form (if you haven’t already) such that when Procurement receive this ticket they can just click the Purchase Request tab and right-click to create the purchase request – that way they are linked too. The business rule sends the line manager an email containing the details he/she needs (including the line items) and provides two links at the bottom of the email that allow them to either Approve or Reject the request. Now, as you can see from the Body, this business rule makes use of a SQL Server User-Defined Function that does not come with Service Desk Express. To use this function see a previous post – Purchase Request Line Items in Email, and you will need the HTML version of the function (Function GET_PR_LINE_ITEMS_HTML). So, the line manager clicks the appropriate link which will open a new email (preformatted as required) for them to make their decision. Whatever they write in the body of the email will be recorded with the decision. This leads us nicely onto our next business rule. Creates a Purchase History record, linked to the Purchase Request, showing what decision was made, by whom, and when. It also includes the body of the email as a potential reason as to why the decision was made. Updates the Purchase Request record, setting the status to be whatever the decision was. Sends an email notification to the requester, advising them of the decision made by the approver and whatever was in the body of the email as a reason. Following on from that we have our fourth business rule which kicks in, only if the decision was APPROVED. Ok, so the final bit of functionality we need is to be able to forward the purchase request to the vendor, as a purchase order. I guess at this stage it makes sense to state the obvious here – this post is a demo of the art of the possible. I am not suggesting that what I am sending to the vendor in my example is a well thought through purchase order. That said, hopefully, it should be very easy to see how the examples could be adapted to include the necessary information that your vendors/organisation require e.g. delivery address etc. So, once the technical team add the purchasing history action of ORDERED to the purchase request, the system will automatically send the request as a purchase order to the vendor for delivery. So that is it for the business rules. Service Desk Express (like many other applications) is one of those applications that once you really know how to use it, seems really user-friendly – you just kind of learn to love to the little qwerks (either that or I have become a very sad person). Having said that, for those people who don’t know it and love it, in many ways it is not intuitive. The Purchasing Module is one of those areas that really needs to be trained. Making the likes of the Status ID field read only can be an excellent idea, but only if you have explained how Purchasing Actions work. Anyway, I would suggest that your end-users (clients), including your approvers, probably don’t need much (if any) training. They already know how to ask for things! Your Service Desk staff need to understand that by creating/updating an incident to a Subject ID of “PR” will cause a business process to take effect – you might even create a standard description for the Subject ID that provides the service desk team a template of information the procurement team will need. Your Procurement Team need a whole bunch of training – the need to own the purchasing module! They need to understand how the Inventory Categories link to the Inventory Catalog etc. etc. Don’t skimp here. This team needs to be your biggest fan! The Technical Team (in my example) will need a lot of loving! The last thing they want to be doing is creating purchase histories. They need to buy into why they are important in this process – one possible selling point is that they are acting as the gatekeepers of the network – no-one gets to buy stuff for the network without it going through them. This also means that users will ultimately get a better service as the technical team will be able to suggest compatible items etc. So that is it – I hope it has proved helpful. Many people don’t realise the benefits of utilising the purchasing module when it comes to service delivery. Incorporated well, it can provide your organisation with a wealth of management information that can assist quality decision making. Clearly there is a whole bunch more stuff that we could do and indeed, stuff that we could do differently. As always, comments are thoroughly encouraged – positive or negative. Just to make this a little more challenging we will assume that your organisation does not have Client Services and consequently cannot use the Self-Service part of Purchasing. To be honest, in some respects that is a blessing (in my humble view of course) as it is anything but user-friendly! Before attempting to use the Purchasing module, it is essential that you understand the business processes surrounding e-Procurement within your organisation in relation to Service Desk Express. As I said earlier, I am assuming that you don’t have Client Services and I want to make the business process complex enough to be real. A user has a need for something and consequently, via Self-Service, telephone, or email, raises a request. That request is routed to the Procurement Team who check if the item is in the inventory catalog. If it isn’t then it needs to be sourced from an appropriate vendor who needs to be added to the system if not already in existence. Once sourced it can be added to the inventory catalog with its appropriate details including Sales Vendor ID. The procurement team will then raise the purchase request with the appropriate line items. Once complete the procurement team will send the request for authorisation from an appropriate manager in the business. If the manager rejects the request we will let the requester know and update the status of the purchase request to rejected. However, if the manager approves the request the status of the purchase request will be updated to approved and sent to the technical team for delivery. What is important here is that the technical team needs to decide if the requested item is already available in stores. If it is then the requested item is deleted from the request leaving any remaining items that need to be procured. A history entry needs to be added for any items that are deleted. The technical team will then send the purchase request to the vendor as a purchase order to deliver the remaining items and allocate any items from stores to the users configuration and delivered to them. Once the items have been delivered the items will be receipted and added to the user’s configuration before being delivered to them. 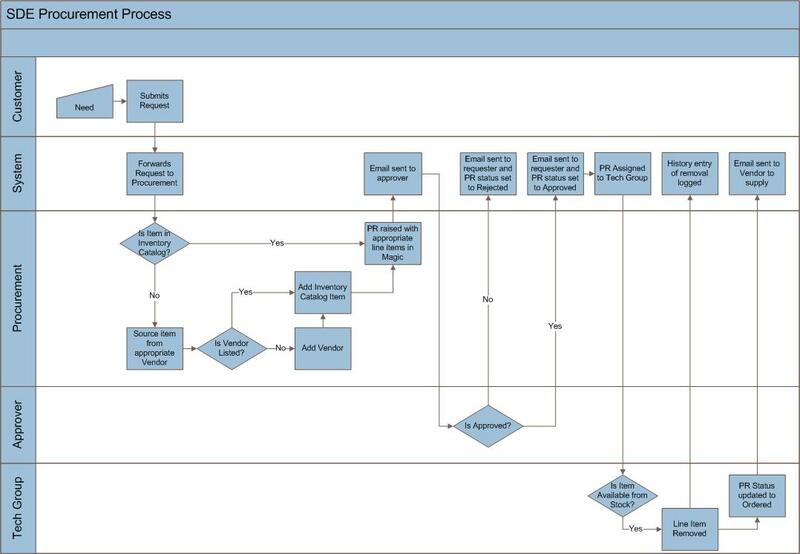 The above diagram shows a business process up to the point of procurement. Procurement Group: It is important to control the catalog and related areas. As such this group should be the only group that has permissions to Insert/Update/Delete inventory categories, inventory catalog items, and vendors. In my organisation the procurement group is also responsible for raising the purchase requests themselves. The Approver: It is necessary to decide how you want to identify the approvers within your organisation. Generally, these people exist in the clients module of SDE but are identified as having additional powers! For example, it may be that you are simply given the status of approver and in which case there would be a boolean (Yes/No) field in the clients module that identifies these characters. Far too boring for my fictitous organisation – we are going to have a line manager per client and the request needs to go to the line manager of the requester for approval. If you operate off multiple sites there is no way a central procurement group would know if an asset was, as a result of another request, about to made unavailable. Consequently, a situation could arise where the item was deleted from the purchase request and then not available from stock. Secondly, one would hope that your technical group have technical skills! As such whilst a client might request a Dell D610 Laptop, a technician might be able to provide an alternative Dell C610 instead that we have in stock. There are very few database customisations required to make this work. The main one is to identify the approvers – so we need to add a new foreign key field in the clients module called Seq.Manager that references the clients module. Assuming that anyone following this already has a bunch of clients in the system you wont be able to prevent nulls so I would suggest that you should check “Required if on form” to all the additional fields specified. Once that foreign key is created we need to create a virtual fields inside it referencing the Client ID, First Name, Last Name, and Email Address of the manager. I suggest you call these fields something like Manager Client ID, Manager First Name etc. To make life easier we are also then going to add some new virtual fields to the existing Seq.Client foreign key in the purchase requests module. The fields we want to add are the new fields we just added to the client module i.e. Manager Client ID, Manager First Name etc. An additional field I would suggest, although not necessary is to add a Cost Code field to the purchase request module – perhaps a string of 255 characters. Most organisations I have worked for want to assign costs of purchases to internal codes. We also need to add an additional field into the vendor module called Vendor Email of type Misc > Email. We will use this, not surprisingly, to hold the Vendor’s email address so that we can send the purchase request directly to them. New Client: A new copy of the client form with our new fields added to them to allow the line manager for each of our clients to be selected. New Purchase Request: A new copy of the purchase request form where we can add our new cost code field and the additional Manager Client ID, Manager First Name etc. if you want. This form is not necessary if you didn’t add the cost code field. New Vendor: A new copy of the vendor form with our new Vendor Email address field added. Open, For Approval, Approved, Rejected, and Ordered. These are the minimum for my fictitious organisation. We will also create Cancelled, Received Part and Received Full for reasons that will become apparent later. Find the existing Open action and update it to show the new status of Open. Create a new action of For Approval with an old status of Open and a new status of For Approval. Create a new action of Approved with an old status of For Approval and a new status of Approved. Create a new action of Rejected with an old status of For Approval and a new status of Rejected. Create a new action of Ordered with an old status of Approved and a new status of Ordered. Open the existing action Received Part and update the old status to Ordered and the new status to Received Part. Open the existing action Received Full and update the new status to Received Full. Create a new action of Cancelled without an old status and a new status of Cancelled. Finally, create a new action of Note with no old status and no new status. We are going to use this to log the deleted line items. Support Subjects (Categories): Create a new support subject for Purchase Request. For the purpose of my fictitious organisation the Subject ID will be “PR”. Groups: Create a new Procurement group and a new Tech group. Again these can be whatever work for your organisation. So that is it for the business processes, groups and roles, database and form customisations, and required data records. In the next part of this series I will cover the remaining bits of business rules and training. Validated fields – friend or foe? Whenever you require a field on a form that has a definitive list of values to choose from, a Service Desk Express administrator is always faced with either creating a dedicated module and foreign key reference or a validated field. So what is a validated field? A validated field is a text field (or more accurately in database speak – a varchar field) of a size able to accommodate the largest option. The options, added through either the DB administration tool or the customisation wizard, are enforced using a check constraint on the column created. As such, even if you try to insert the data direct into the table using, for example SQL Enterprise Manager, you cannot insert a value other than those allowed. Accessing the values available of a validated field? The query above, for example, will return all the options of the network field from the _SMDBA_._CONFIG_ table. You simply replace the tablename and the column name to get your options. When to use a validated field vs. a dedicated module and foreign key relationship? Validated fields are significantly more efficient at reading data than foreign key relationships as a join is required to retrieve the information from the appropriate table in the case of the foreign key. Whilst the effect of this can normally be reduced using an INNER JOIN if the foreign key column is mandatory, Service Desk Express does not make use of these efficient joins in its views and consequently performance is affected. Validated fields cannot be re-used as they are table specific. Consequently if, for example, you have a list of locations a validated field would probably be a bad choice as you may want to use this list in a variety of modules e.g. Incidents and Work Orders. In this example, a dedicated module with foreign keys from both the Incidents and Work Order modules would be a much better bet as you would only need to update the list of locations once and both foreign keys would be reading the new data. If you have a lot of options then a validated field is almost certainly a bad choice. Particularly with advances in Service Desk Express that allow you to show foreign key fields as drop down lists (emulating validated fields) using form customisation, validated fields are usually only sensible with less than 10 records. Validated fields provide no way for the end-user to search for the value other than scrolling through the list. Not that this should be a reason per se but, validated fields are easier for novice Service Desk Administrators to get their heads around and make use of. Whilst maintaining the list of options in a validated field has become considerably easier using Service Desk Express, if your options are likely to be changing frequently a dedicated module is a much easier solution to maintain. Use a validated field if you have less than 10 options which are unlikely to change and will only ever be used in one module. Validated fields also offer a significant performance boost where the number of records in the table is very large. Use a dedicated module if you have more than 10 options, or the options are likely to change, or the options will be needed in more than one module. As always, thanks for reading and I welcome any comments. Then grant permissions to Public to Execute this function. Finally use the function in your business rule e.g. When PR is updated with a change of status from Approved to Ordered send email. What basically happens is that the function concatenates all the line items into a single string that can then be used in the body of an email. Hope this maybe of use.